This weekend Kate and Kate put on an amazing activity for the Girl Scouts across the UP (and even some from Wisconsin). The girls ranged in age from about 7-15. We had a great turnout, and the girls seemed to have an great time! 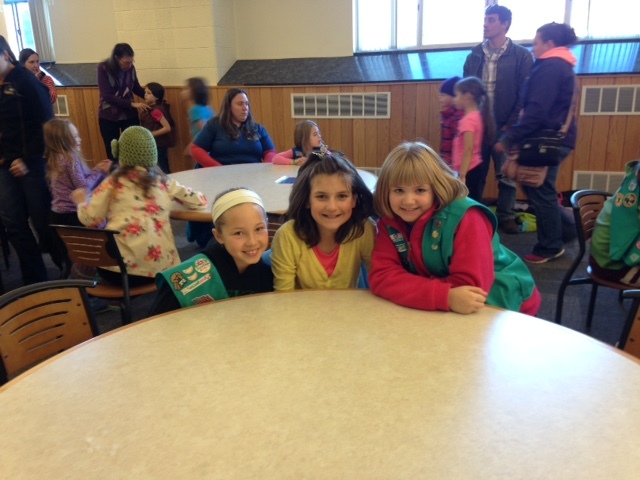 First, some SWE members joined the girls for lunch in Wad’s Cafeteria. Afterwards, they joined the rest of the SWE members for some awesome team-building, creativity, engineering-exploration activities. Their main event was a cardboard boat competition, to relate them to our yearly homecoming tradition of cardboard boat races. They were given material and had to work as a team to create a boat that would hold the most rocks before sinking. Several SWE members also participated in a panel to give the girls an idea about what each of the engineering disciplines was about. This was a great time for the girls to ask some good questions! Our goal was to help the girls realize all the different reasons to become an engineer. And most importantly, that it’s not always about being awesome at math, making money etc. Their last activity was something they could take home to remember the event. They each were given a carnation with a cup of water and food coloring. So, hopefully over the next few days they will be able to watch their carnations change colors. A HUGE HUGE thank you to Kate and Kate for putting together such a large, and successful event. It went extremely well, and was perfectly on schedule. We are lucky to have such amazing Campus and Community chairs. Another big thank you to all those volunteers who spent their Saturday making the day great for these girls. Some traveled far, and I think it was definitely well worth it for them.